My craft room almost looks like this! 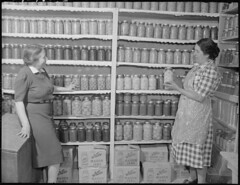 I discovered canning last spring and had all the zeal of the newly converted. I canned a lot. I mean a LOT! Jam, jelly, salsa, many varieties of pickles, tomato sauce, preserves, ketchup and even barbecue sauce. I’ll be posting some of my favorite recipes soon because in no time flat we will be back in strawberry season. Can I get a hallelujah? One aspect of all this canning is the accumulation of jars and rings as we eat through what we put up so many months ago. I know we will reuse the jars this season, but really, the Mason jar is just a darn convenient invention. I’ve been looking for inexpensive upcycling ideas to use with our Girl Scout troop and came across this article. Check it out. If you’re snowed in thanks to NEMO and need a few fun craft projects, this will get you started! Get ready for some canning ideas and recipes! What is your favorite food to can? Hallelujah! I miss berries. But I am terrified of canning. You know I have a billion (okay like 7) ridiculously hot pepper plants growing in my house right now. They are Carolina Reapers I think– Chad’s project. The moral of this story is that I’m gonna need to learn how to can because I am gonna have to make a ton of salsa/hot sauce with these things. I know what you mean! We ate our first jar of jelly gingerly–I was terrified I would poison everyone. So far, so good though! We also froze some of our peppers whole and pull them out as we need them. That is a lot faster than canning! Hallelujah! My mom was a prolific canner against her will, but I have not been brave enough. Perhaps this year . .. It has been so nice to just go to the pantry and shop for jams, salsa and tomato sauce this winter! I think it helps that I don’t “have” to do it. If I did, I might resent the time involved. Freezing is a great option too, though! Good luck!